Join us to make any cosplay anything. Cosplay Club is our new way of helping you make costumes! 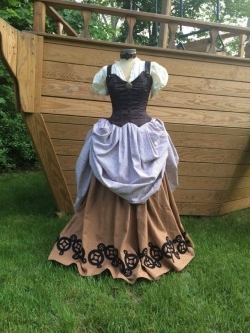 Bring down your current cosplay, steampunk, renaissance, fantasy, historical or costuming whatever and our professional costumers on site will help you build your dreams! Give us a call if you have any questions on specific cosplays. Bring your machine and all your supplies needed for your project. If you do not own a machine, you can rent one for the evening for $5, no matter the machine! This class will be held 9 days. There are 4 spots left out of 6 available!